Now I know I’m not the best photographer & editor in the world! But I thought this could be useful as a guideline for anyone starting out, or wanting to make their photography a bit better. *The photos below were taken by my iPhone camera which is why they’re quite shoddy. Firstly, make sure you have great natural lighting & set up your flat lay or set up & make it look aesthetically appealing. Maybe add some props or fairy lights. Look through your camera as you do this to see what would look nice on the picture. Adjust the items you use, change them around if they don’t seem to look good. Before you take any pictures make sure your settings are great, maybe fiddle around and see what looks nicer. My camera has lots of pre-set settings that I like to try out. I use a Lumix GX7 which is pretty beginner friendly, and I put it on a tripod to get more stable pictures that aren’t blurry. Plus you can use self-timer to get close ups and great images. Whilst taking pictures I look back through and zoom in to make sure they’re in focus so I don’t have to re-take pictures again. After taking photos I go through the files and put my favourite ones into a separate folder on my laptop. I love PicMonkey for editing, it’s so user-friendly and easy to use. I crop the photo to get rid of any unwanted background mess and to focus on the main focus. (although sometimes it’s nice to have a good background with props visible!). I use the ‘auto-adjust’ and work from there, usually, the auto adjust edit is totally off & weird but sometimes it can be perfect! Whenever I up the brightness I up the contrast so things don’t get washed out. Last but not least, adjust the temperature!!! If you take pictures with your ‘big light’ on you’re gonna have too much warmth in the picture, cool it down. Here’s the before and after! I’m improving with every blog post, so I’ll probably do an updated one some time! Hope this helps in someway! Thank you for reading. ← Products I’m Using Up! Thanks for letting us take a peek into your blogging process! 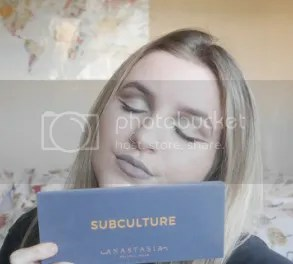 I love your background and how you set up your makeup!